This beautiful red Bordeaux is 80% Merlot and 20% Cabernet Sauvignon. Sounds simple enough, but somehow the vintner managed to turn it into an unusual, very interesting, highly aromatic wine with the heady bouquet and taste of flowers including violets and lilacs. It’s dark purple in the decanter and dark garnet in the glass with ruby and pink edges. Medium-bodied, this wine is soft and mouth-filling, flavorful, and dry yet mouth-watering, with a surprising amount of spice on the rather long finish. Aged in French oak, its structure is taut and fit, like a danseur supporting a ballerina. This wine is perhaps the slightly quieter equivalent of the 2007 Côtes du Rhône, J.L. Chave “Mon Coeur,” one of the wines we reviewed earlier this year (http://www.thefrugalwinesnob.com/?p=81). We wanted to name the Chave “Wine of the Year” but it isn’t available anymore! It is also similar to the 2005 Marques de Riscal Rioja Reserva (http://www.thefrugalwinesnob.com/?p=20). Guess I’m just a pushover when it comes to flowers. It is beautifully balanced with plenty of blackberries and plum. The oak comes through more as an undercurrent than as a direct flavor. This wine is exquisite by itself. 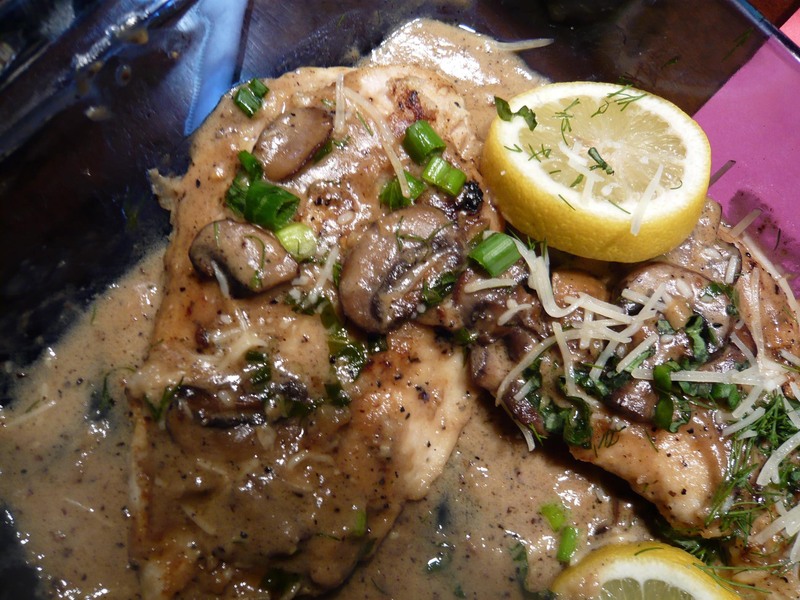 But tonight, we paired it with Chicken Caro, Clark’s invention of chicken breasts lightly dredged in flour with lemon pepper, pepper, garlic salt, sea salt; braised in butter, olive oil, lemon, basil and wild mushrooms; covered in a sauce of Chardonnay and lemon reduction, with chicken broth and heavy cream; topped with shredded Parmesan cheese, fresh herbs on hand (tonight, scallions, basil and dill). 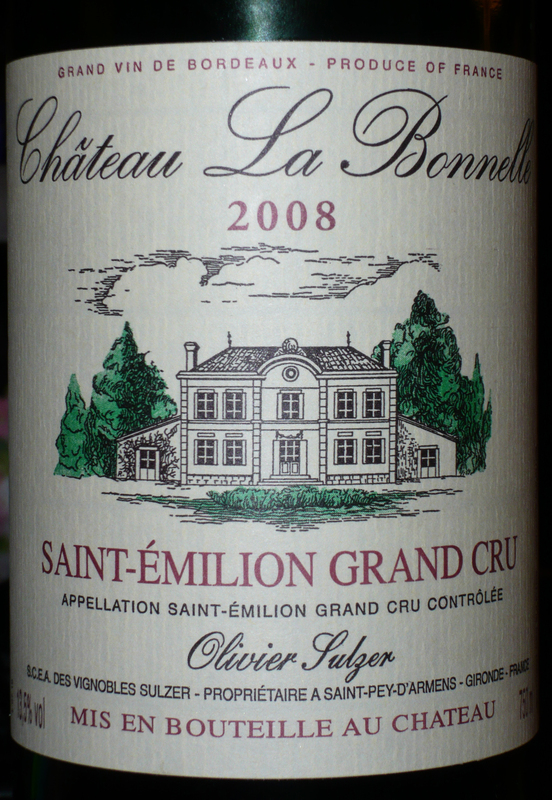 LABEL NOTES: Château La Bonnelle is one of the famous Grand Crus of Saint-Emilion. It is situated East of this magnificent village, classified world heritage by UNESCO. The Salzer family, owner of the Chateau for four generations, guarantee you the origine and the quality of this great wine, produced with the respect of the know-how from Bordeaux. Manual harvest, malolactic fermentation for 30 days in new French Oak barrels. Aged for 16 months in 50% new and 50% 1-year old French oak barrels. One part of the barrels comes from our proper oak forest in the Dordogne region. WEB/TECH NOTES: 4,500 cases made. Wine Character: A delicate and balanced wine. Never overpowering with soft red and purple fruits enriched with subtle tannins. Generally needing 2 to 3 years in bottle to start showing it’s best. In the better vintages our wine will peak at around 7 to 10 years. Good with most light to medium flavoured food including Oriental. Vineyards: 13 hectares planted with 80% Merlot and 20% Cabernet Franc. 10 hectares of which hold vines of above 40 years of age. Density is 6000 vines per hectare. Soil: Sand and clay, in parts with iron deposits over deep gravel. Viticulture: No herbicides and only natural fertilizers are used by rotation every 5 years. Pruning is short with a double guyot system. Leaf thinning and green harvest when and where necessary. Vinification: The harvest is sorted twice. The first selection takes place in the vineyard and a second one on the sorting table just before crushing. Pre fermentation maceration ensures good aromatic extraction. Alcoholic fermentation takes place in small, temperature controlled stainless steel vats to respect the different parcels of the vineyard and various maturity stages. This is followed by a hot Maceration. Draining off takes place soon after, keeping the fine lees in the wine. Malolactic fermentation is partly done in barrique. Ageing: 18 months in barriques of French oak, one third of which are renewed every year. Part of the oak comes from our estate in the Dordogne. (See Chateau de Ponteyraud). Bottling and storage takes place at the Chateau. This entry was posted in Cabernet Sauvignon, Food, France, Merlot. Bookmark the permalink.